These are my favorite no bake cookies! The salt from the crackers, the chocolate and mint combine for just pure yummy goodness. These are so simple! Cook chocolate in the microwave until just melted (do not overheat). Stir in 1/2 teaspoon of mint extract. Take 2 Ritz Crackers; put together and dip into the chocolate mixture. 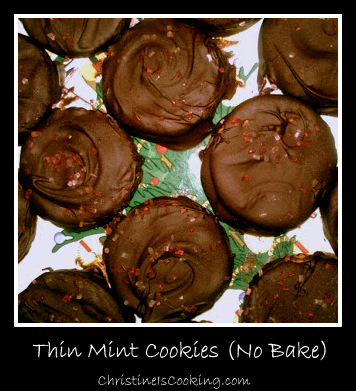 Place on wax paper and sprinkle on mint sprinkles while the chocolate is still warm. These look great! Bet they would be great with Oreo Cookies too.